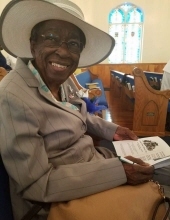 Celebrating the life of Edythe Oliver Richburg "Gwen"
Be the first to share your favorite memory, photo or story of Edythe. This memorial page is dedicated for family, friends and future generations to celebrate the life of their loved one. Obituary for Edythe Oliver Richburg "Gwen"
On Tuesday, October 16, 2018, Edythe Oliver Richburg "Gwen", widow of the late Rev. Claude C. Richburg, heard her master's call at the Kennestone-Wellstar Hospital in Marietta, GA.
Born on August 21, 1928, in Wilmington, NC, she was a daughter of the late William Milton & Rowena DeLaine Oliver. Service of remembrance shall take place on Saturday, October 27, 2018, @ 10:00am from the Friendship AME Church, 6156 Furse Rd., Pinewood, SC, where the Pastor, the Rev. Albert Thompson, shall preside. The Rev. Joseph Postell, Presiding Elder of the Lancaster District, shall bring words of comfort. The service of committal shall follow in the Richburg family plot located in the Friendship AME Church Cemetery. Public viewing shall take place from 4:00pm-8:00pm at the Fleming & DeLaine Funeral Home, 302 West Boyce St.
To send flowers or a remembrance gift to the family of Edythe Oliver Richburg "Gwen", please visit our Tribute Store. "Email Address" would like to share the life celebration of Edythe Oliver Richburg "Gwen". Click on the "link" to go to share a favorite memory or leave a condolence message for the family.